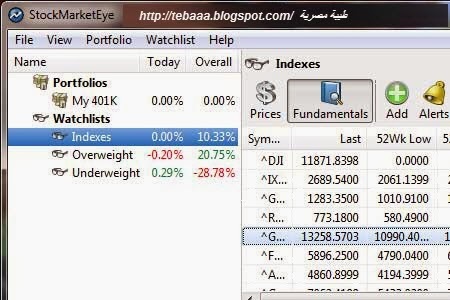 برنامج StockMarketEye 4.0.13 وظيفته مراقبة حركة البورصة وسوق الأوراق المالية، حيث يمكنك متابعتها عن طريق الرسوم البيانية،كما يمكنك مراقبة استثماراتك الخاصة في أسواق البورصة . StockMarketEye is a software which will help you view and analyze the stock market. Track the performance of your IRA and other investments with portfolios. Keep your eye on the market with watchlists. Gain perspective on market movement with dynamic stock charts. See the performance of all of your investments at a glance with the investment tracking overview. Find ticker symbols with the built-in symbol search. Get free quotes, updated automatically or on-demand. View basic fundamental ratios.